This is about the point when I should really be showing off my finished fair isle yoke sweater, because it’s done and I’ve worn it and it’s lovely and comfortable. But of course, I still haven’t managed to get some finished object shots of it, so I’m a bit behind. I also need to do a proper 2010 projects-roundup, but I’ll get there soon. In the mean time, I wanted to go back to the whole ‘steek’ thing, because I mentioned cutting the steek back in my last post before Christmas, and realized after a few of you commented about it, that I didn’t actually fully explain what a steek is and there may be some of you wondering what the heck it is, or who do know what it is but haven’t done one. Steeking, or cutting a steek, is, when all is said and done, the act of cutting up your knitting on purpose. You do this when you want to create a gap or opening in a piece of knitting that you have worked in the round, and the steek is the part of the knitting where you anticipate the cutting will happen. This is instead of what one might normally do in a styled garment, which is to work flat and turn the work at the point where these gaps normally appear – the cardigan front, the armholes, the neckline, etc. 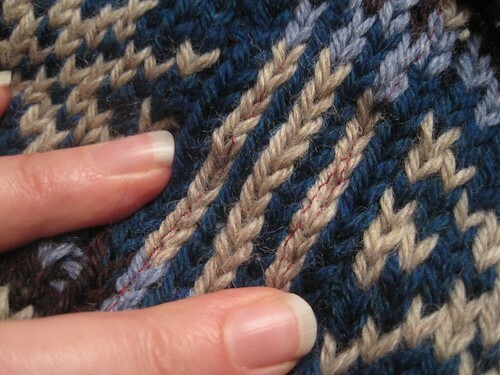 One inserts a few ‘extra’ stitches where the gap will appear, and carries on in the round. It’s pretty common to do this in stranded colour-work garments, because it means you only have to ever work the Right Side of the work while knitting in two colours at a time, and that saves you the trouble of trying to purl in two colours on the Wrong Side of the work. (Having said that, there are people – my mother included – who choose to simply work the Wrong Side anyway and omit the steek, because they prefer two-colour purling to having to do the steeking thing. It’s whatever brand of crazy you prefer). If you’re doing this in 100% non-superwash wool, you don’t even need to reinforce it if you don’t want to, because the wool stitches cling to their neighbours well enough that it will not unravel. Unless, you know, you’re planning to really manhandle it or throw it under traffic or something like that. But there are different ways of reinforcing steeks, and in this case I did a sewn reinforcement – running two lines of sewing down the edges of the steek stitches, which is the quickest and most versatile way to reinforce a steek. (You can see the lines of sewing in the picture, above). Back in December before Christmas, I had the wherewithal to get my sister to take a video clip while I was cutting the cardigan steek on the sweater. Because let’s face it, this is a one-shot opportunity. There’s no do-over on cutting up your knitting. I was hurriedly trying to finish my sweater alongside gift-wrapping, baking, visiting, etc – which probably explains my slightly frenetic tone of voice in the vid, heh – and honestly, the cutting up took less than a minute. If you haven’t had the good fortune to cut up a sweater of your own and want to know how it goes, well. This is how it goes. Seriously, this is one of the best things ever. You can try it at home any time you want. Knit up a swatch – or even better, just go and find an old swatch in wool yarn, and make a vertical cut in it, and carry the bits around in your handbag for a while and see how it holds up. It’s awesome. As for the post-steeking work, a couple of people asked how I was going to finish the steek after it had been cut, and I took a couple of shots here as well. There are naturally different options for finishing a steek, depending on what you want to do with the sweater. Elinor, who has done a yet awesomer job than me of explaining all of this, has a nice photo tutorial on the subject of reinforcing and finishing. 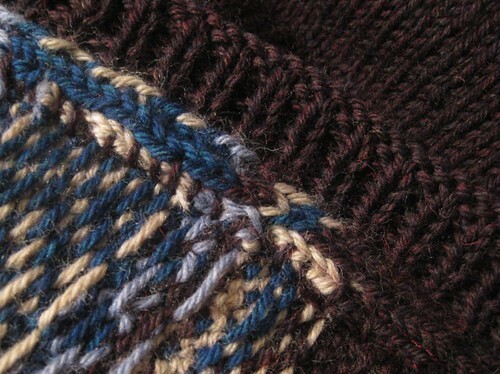 In this case, I knew I was going to work a ribbed buttonband along the cardigan fronts. So, I mostly just wanted everything to look tidy on the inside. Nobody would fault you for simply trimming the sewn edge evenly and leaving it as-is, but I decided to go one step above that. I folded down the edges towards the inside of the work, and neatly stitched them flat. And then, you have a finished sweater. It’s pretty great. The only problem is that it’s entirely possible that once you’ve cut one steek, you’ll have the bloodlust and will want to cut up something else. Which means that you’ll have to go off and knit another project that requires steeking. But then, I suppose that’s not a problem after all, is it? Steeks are fun. I’m a bit meh that I currently haven’t got any projects on the go or in the line-up for steeking. Nothing like chopping up your knitting to make you feel you’re in control of it! Great photos. Can’t wait to see the whole thing. I can’t believe I have yet to steek! That’s something I plan to learn this year. Am also contemplating doing sleeves that are supposed to be knit flat in the round because I want to avoid purl sided color stranding. I think I agree with your particular brand of crazy rather than your mum’s. But to each her own, and isn’t it *marvelous* that knitting can accommodate many different viewpoints? There’s a lesson there somewhere…. Your video was very informative and you talked it thru very calmly. Cutting up my knitting seems counterintuitive, but it is faster to knit in the round than back and forth. You have inspired me to try this in 2011. 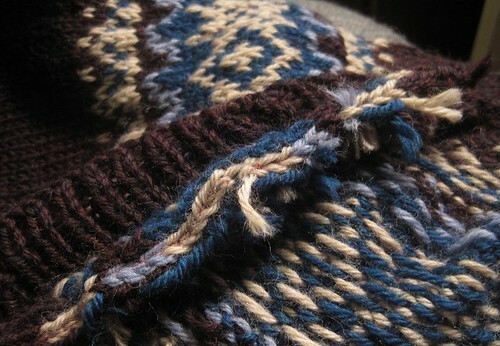 Steeks are definitely the answer: I’ll do much to avoid fair isle on a purl side! Nice work with the video and ALL! Oh, this is one of those things I’ve always wanted to do. Unfortunately, having the attention span of a squirrel on speed prevents me from actually finishing (or starting, for that matter) anything that requires a steek. The thought of steeking terrifies me, so it’s good to see it in video. But man, the sound of those scissors cutting through yarn – it’s painful! Steeking terrifies me. Your video made it look simpler than I’ve ever seen it explained before, but I still gasped when you started cutting. Maybe I’ll get a wild hair and try steeking one day. 😉 The cardigan looks beautiful! Can’t wait for the FO post. I’ve only done it once but I love steeking! I think it’s much easier then purling with two colors – even if it’s a tad stressful it gets the job done much faster.